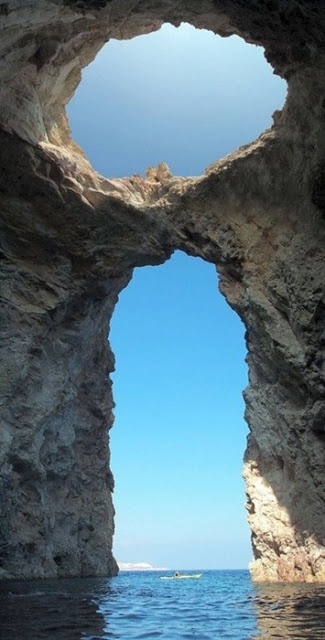 The Blue Grotto is actually a number of sea caverns on the south coast of Malta, east of the fishermen's harbourWied iż-Żurrieq near the village of Żurrieq. It is located right across from the small uninhabited islet of Filfla. Every day from sunrise until about 1 pm a unique sight can be observed here. The location of the cave combined with the sunlight lead to the water mirroring showing numerous shades of blue. Several caverns mirror the brilliant phosphorescent colours of the underwater flora; other caverns show a deep dark shade of blue.